Is there a better alternative to LCVII? Is LCVII really the best app in Desktop category? Will LCVII work good on macOS 10.13.4? 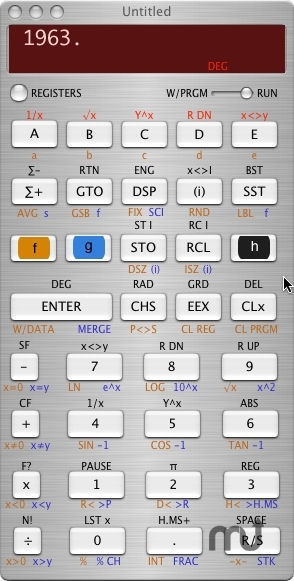 LXVII is an HP-67 calculator simulator for the Mac OS X platform. It was conceived because I needed a calculator for my taxes and after downloading a bunch of RPN based calculators I found most of them wanting. Some were lacking basic features, others had so many features they were too confusing or cumbersome to use. I plugged in my HP-67, with its long-dead batteries and magnetic card reader, and copied the answers from display to tax-forms by hand. LCVII needs a rating. Be the first to rate this app and get the discussion started! At about the same time, I had been looking for an application to use as a springboard for diving into learning about Mac OS X application programming. It seems that an RPN calculator is a good application for learning an object-oriented application framework, (a lot of the calculators I downloaded were starter applications) so, a couple of years, and lots of reading and debugging later, LXVII is ready for beta test.